Walt's love of dogs had caused them to become source material for many of his live action films. And while audiences weren't always receptive to them, he didn't stop making them. A book called Big Red by Jim Kjelgaard was the inspiration for Walt's next dog film. At it's core, it's the story of how a lost dog brings two unlikely people together in a touching way. The screenplay was adapted by Louis Pelletier, his first of many Disney films. TV director Norman Tokar was brought on to direct his first theatrical film and first of many for Disney. Walter Pidgeon stars in his only onscreen Disney role. Émile Genest returns to the studio after playing in Niki, Wild Dog of the North. The rest of the cast were mostly French Canadian actors who didn't appear in any other American films. It was produced by Winston Hibler, famous for the True-Life Adventure series. He no doubt lent his expertise at filming animals to many of the scenes. Filming was done mostly on location in La Malbaie, Quebec, Canada and at Big Bear Lake in California. Some of the interior scenes were filmed on sets at the Walt Disney Studios. The Sherman Brothers wrote two songs for the film: "Mon Amor Perdu" and "Emile's Reel." The film begins with Mr. Hagan buying an Irish setter for $5,000 as the credits play. We then see a young boy approach a dog kennel where the Irish setter gets so excited to see him, he twists his paw in the gate and when the boy opens it, the dog takes off into the woods and the boy chases it. It turns out he is an orphan who is looking for work and Mr. Hagan decides to hire him. The dog's name is Red and he takes a liking to the boy, whose name is Rene. Rene objects to Mr. Hargan's training methods of Red and starts to privately train him. When Mr. Hagan finds out, he moves Red into his house and forbids Rene to see him until after the dog show so that Red will be completely obedient to him. When Rene goes near the house, Red jumps through a glass window to get to him and gets injured. Mr. Hagan wants to have him put down, so Rene steals him and takes him to his deceased uncle's cabin until he is rehabilitated. Rene returns Red to Mr. Hagan and quits his job. Red and Mr. Hagan's other Irish setter, Molly, are shipped off to be sold. However, both dogs escape in transit. Meanwhile Rene has taken up a job as a farm hand when he hears what happened to Red. He runs off to find him when nobody else believes they are alive. When he reaches them, Molly has had Red's puppies. Mr. Hagan learns that Rene has left and he takes off in search of the boy, where he gets knocked off his horse when a cougar approaches and his foot gets pinned behind a boulder. Red finds him and gets in a fight with the cougar and Rene arrives in time to shoot the wild cat and save both Red and Mr. Hagan. Mr. Hagan decides to adopt Rene and they return home with Red, Molly and the puppies. Big Red was released on June 6th, 1962. Critics admitted that the film had charm, but felt it wasn't as good as Disney's most recent films. It wasn't a success at the box office either. It was shown on TV only two years later in 1964 and made its home video debut in 1984. As a standalone film, Big Red is charming and heartwarming. Rene is an inspiring young boy and Gilles Payant does a great acting job in the role. Walter Pidgeon is also superb in his portrayal of Mr. Hagan, a task that couldn't have been easy given many of the unlikable things his character has to do. He pulls it off meticulously so that the audience never truly dislikes him. The on location shooting creates some beautiful imagery as well. The story is intriguing. It's only when you compare it to some of Disney's other dog movies that it is unable to hold its own. The title draws a lot of similarities to Old Yeller, which is clearly the better of the two films. 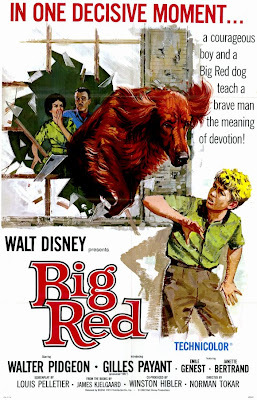 But if you're a lover of Disney dog films and have never experienced Big Red, it is certainly deserving of your attention. Big Red is currently available on DVD as a Disney Movie Club Exclusive. The film is presented in its original matted widescreen aspect ratio of 1.75:1, although the back of the box mistakenly lists it as fullscreen. The film appears to have gone through a minor restoration and looks pretty good. There are no bonus features. The film is also available on iTunes in widescreen and in HD.